It's been a pretty crazy few months for me as (among other things) I cope with turning 30 years old, and the fact that I passed my 10th year mark as a member of the Dark Jedi Brotherhood. Part of that realization is that I spent the entirety of my 20s as a member and leader in the DB, with origins dating back to my teenage years in the Bounty Hunters Guild. I appreciate everyone that I’ve come to know, meet, and interact with over the past 10-15 years of being a part of a Star Wars online community. You all have been vital to my growth as a friend, a leader, a professional in the real world, and most importantly as a human being. It’s a crazy world out there, and it’s been a privilege having a group of friends in my pocket, seemingly, wherever I go to act as support and encouragement no matter what challenges rise to face me. For the haters — those that have found some reason to wish disease or misfortune on me because of disagreements with a for-fun online fan club — I wanted to say that I appreciate you as well. Overcoming adversity and learning to deal with it have been huge to forging my somewhat unconventional career path in the real world. Anyway, hello yes, this is Wally, and here is my 16th formal report as Voice. Let's get back to business. To start off, I wanted to highlight for the newer or returning members what it is that I do as Voice of the Brotherhood. Some might think that it’s just writing fiction for the club storyline, but that is, really, only one small part of the job. On a day-to-day basis, the Voice is the acting Lorekeeper of what constitutes as Dark Brotherhood Canon, which means I need to track and review on all new material that gets introduced into Star Wars new canon. 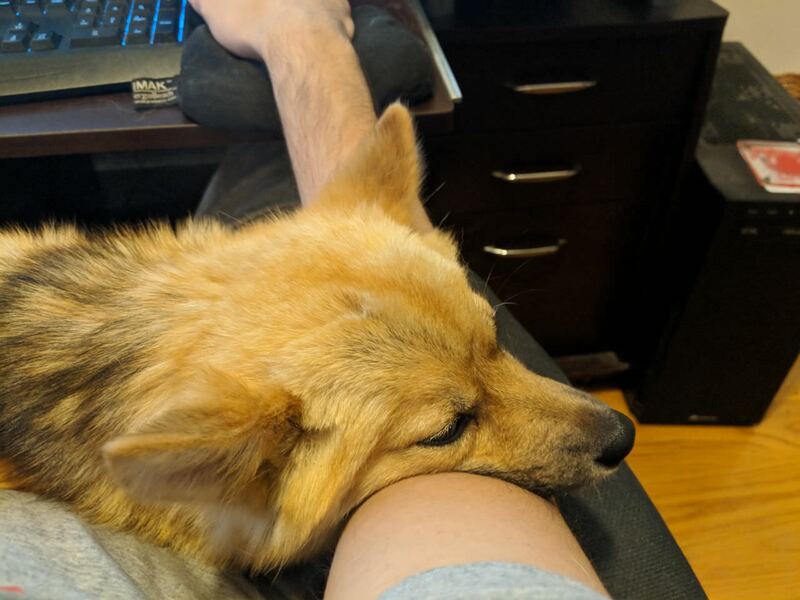 I oversee the operational tasks of the Voice Staff (Character Sheet approvals, competition approvals, and all other relevant administration). Beyond that, I work with the rest of the Dark Council to discuss and research improvements to existing club systems. This includes working with the SCL, the Regent, and even the Fist sometimes to ensure consistency and continuity across the disparate platforms that comprise the Brotherhood. Please see the Voice of the Brotherhood wikipedia page to read the formal documentation of my role, and what it entails. If you ever have any questions as to what I’m doing, what I’m working on, or what is coming up down the pipeline, please feel free to reach out. I have no issues sharing my process or reasoning for any decision or action I take. I don’t do anything based on my hunches and endeavor to utilize as much data as possible to make informed decisions that I think will benefit the club. I am @w4lly on Telegram, but my email remains the best way to reach me: [Log in to view e-mail addresses]. It’s just easier for me to get back to you that way. If you have any issues with changes I’m implementing or doing, feel free to hit me up. I stand by everything I do, but am more than happy to listen to constructive feedback that seeks to continue to improve our club. After a long discussion with the Dark Summit, Mav, Vyr and myself have resolved to address a few issues that have come up following the “Transition” fiction update that Vyr penned and launched earlier this year. I am currently working on an overview/outline of our current and future plans that I will be sharing with the Consuls to make sure that they are able to make informed decisions about Clan/House storylines. While I’m happy to talk about this process with anyone, my efforts and concentration will be focused on your respective Consuls/Proconsuls— they are your liaisons to the Dark Council, so they will remain your best resource for finding out what is going on or what is coming up. I trust them to relay this information to you, so I will in turn do a better job of getting them that information. In full transparency, Mav, Vyr, and myself maintain a separate chat for Fictional Advisory discussion. We don’t subject Howie to our Krathyness, but Atra and Evant are both heavily involved and I appreciate their input and wisdom in helping with the club's fictional direction. I’ve made some significant updates to the Inquisitorius Wiki page. These updates help align the Inquisitorius towards where the main storyline will be heading as tension escalates in the ongoing conflict with The Collective. The Inquisitorius no longer denies its own existence. The Voice of the Brotherhood represents the strength and confidence of the Brotherhood's intelligence and counter-threat network. The finer intricate details such as rankings and internal structure will still remain shrouded in the shadows, but when facing an organization like The Collective, and their Capital Enterprises, a unified front needs to be broadcast to bolster the confidence of the Brotherhood’s forces. The Advanced Inquisitorius Network (AIN) is formalized. I teased this in Chapter 4 of the Great Jedi War XII storyline, but you can read more about it on the wiki here. A Director of Operations — the right hand of the Voice (in fiction) — has been named. This role will be an ongoing “anchor” for the Inquisitorius. Ness will act as the first and current Director of Operations, but future Voices will be able to (if they so wish) replace her with another Director. The main drive behind these changes is to create continuity between Voices in the future. While the Voice might change over, the Inquisitorius is a well-oiled machine that continues to run under a consistent NPC leader that can remain static or serve as a future plot point if needed. This is a strategy I hope to mirror to other areas of the Brotherhood's societies. 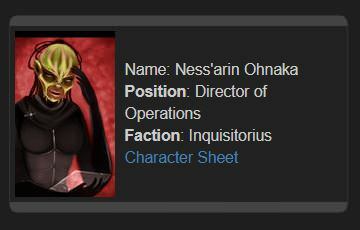 The Inquisitorius Faction page has been updated to reflect Ness as the Director. You can also see the Antei Combat Center staff listed as well (NPCs). 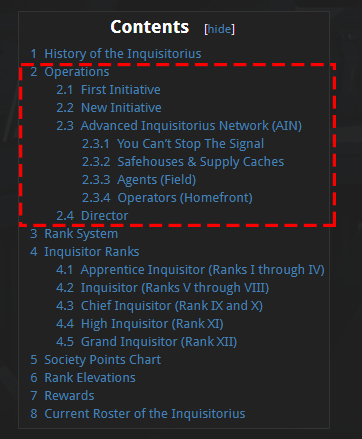 We’re currently working on some coding things, but for now, you can toggle back to the Dark Council Faction page to see the Inquisitorius ships, some of which are covered in the AIN stub of the wiki page. Evant is a superstar for putting all of this together. 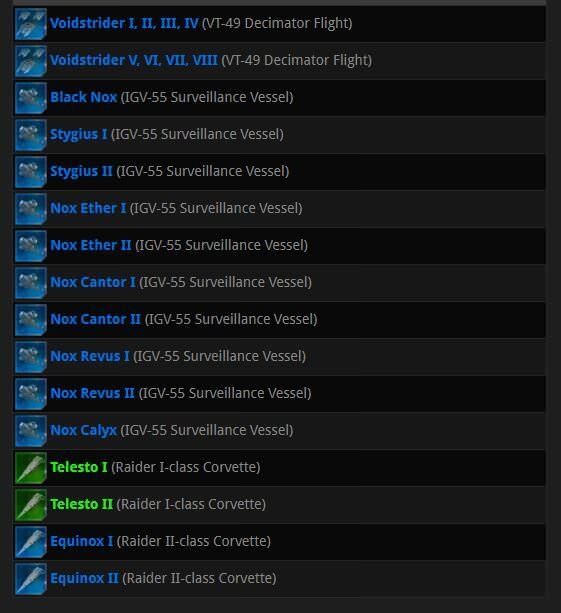 You will also be able to see the rest of the Dark Council’s fleet/assets as we program them in. These will tie into the expanding fictional presence of the Brotherhood, piggybacking on the creation of Arx. My hope beyond hope is that the work we’re doing now, even if some smaller things get updated/changed, will provide the foundation for the future of our club's fictional world. This will factor into my next fiction update, so stayed tuned. It’s a bold move, Cotton. Let's see how it plays out. I’m going to highlight a few projects that I am currently working on alongside mapping out and writing the next few fictional updates for the club. Piece by piece, the Iron Forces wiki page is coming together. One of my Magistrates, Mauro Wynter, has taken point on this project and will be working on creating a wiki compliment to the new Dark Council fleet possessions items. So, I had this crazy idea. Drac, Atra and I actually all talked about it in a Google Hangout closer to when all of us had just settled into our new roles. Why not have a leaderboard for the fiction society to highlight the top active writers in the club? It has worked out well for gaming over the years (regardless of your opinion of the new changes, which personally I’m down with. Nice work Dracpool.) While we were excited by the idea initially, we decided to shelve the idea as we had some other challenges to tackle, but recently I submitted my first draft of a proposal to the DC. First draft was given feedback by the rest of the DC. I’m currently in the middle of compiling a new data set with James (tracking previous quarters placement under a new formula). Initially we just did pure and simple top Cluster of Ice earners. While that could work, we want to accomplish a bit more if we’re going to try out this kind of system. Drive and increase fictional activity and competition by providing a quarterly leaderboard that highlights the clubs most active writers and offers both in and out of character awards. Further Incentivise earning Clusters of Ice and placement in fiction events. Further incentivise ACC match completion (both win and loss). Align with the Gaming Societies popular GMRG Leaderboard, without copying directly and making it feel unique. So, that’s the “why”. As for the “how”, I will keep you guys updated as I study the data sets James provides me. There are plenty of challenges to consider, and I will be heavily trusting my staff, Atra, and the rest of the DC to make sure that this idea plans for as many potential variables it would face in the field as possible. As a major major reminder, this is just a proposal that I’m working on. I’ve been given approval to pursue it, but nothing is final, and it may very well be passed or shelved for later revisions. I figured I would share my process with all of you so you were in the know as much as possible. Can’t give away all my secrets, though ;). I’m going to be bringing back Voice-sponsored fiction competitions on a monthly scale. The goal of this will be to help members have more opportunity to align with the macro, overarching storyline of the club, or to flush out their own stories that diverge from it. The reason I’ve strayed away from these the past few years was that my focus was on system and documentation improvements, as well as a low interest in participation numbers. I also wanted to let members run their own fiction competitions, but those seem to be coming out less frequently recently. I’m confident in where we now have things from a system standpoint, and with my hopes/ideas for the Leaderboard I think that it’s time to drive monthly sponsored fiction competitions. Keep an eye out for one of these to help lead up to the RoS. I will of course be helping to run and organize competitions for the upcoming RoS. I will let the GMs talk more about the finer details, but that will be where my focus shifts when we get closer to mid/late October. I am still working with the Shadow Academy and HM to continue to revamp the writing department. I’m confident with the work that’s being done without me needing to directly dive in to the material. Some select questions from [Fiction Chat - Log in to view join link]. If you haven’t joined yet, what are you waiting for? Kelly asks: What advice would you give to someone who's trying to figure out where their character would stand among all the societies, clan relations and the Collective arc? I'd say to keep an eye on the upcoming fiction updates as the Societies' fictional impact on the Brotherhood is something I've been working on establishing, long term, to help members figure out this exact thing. That said, I’d advise that members should look to craft their characters to how they want to enjoy playing them. If you can narrow down who you want your character to be, it's much easier to then see how they fit into one, two, three, or none of the Societies. The level of integration is entirely up to you, and you alone. Turel asks: What is your favorite DB event you participated in as a competitor and why? How did that event make you feel more connected to the larger story of your unit and the brotherhood? As a competitor, my favorite activity has always been Run-Ons and the ACC. I do not, ironically, get a lot of joy out of writing for fiction competitions because there is no one for me to bounce ideas off of. Run-Ons were where I felt the most connected (there wasn’t much choice) to the “larger story”. They just took a lot of work, coordination, and time management so they were oftentimes more stressful than “fun”. But I have always had fun competing even if I’m not winning. I will say again, though, that I’ve personally never let what the “larger” story was doing dictate or govern how I went about enjoying the club. I used it as a place to start, then figured out how to make my own story work and create my own fun. That’s something that I think current members might not realize. The Brothehood’s main story and direction is just a unified baseline for what’s going on club-wide. You are still, and always will be, free to pursue your micro-storyline and plots for your character. Furthermore, I never let my disagreements with the GM or Voice’s storylines prevent me from enjoying the clubs main events. I took anything I didn’t like as a challenge to work with. I don’t believe you accomplish much by pouting or refusing to rise to the challenge. I’m a competitive person though, even if I don’t win all of the time, and have always been driven to lead by example and to try and make the most of my activity in the organization. Turel asks: What are you most proud of about your term as Voice so far and what do you hope to accomplish before you move on to bigger and better things? I don’t really have bigger or better things really at this point in my career. I’ve hit all of my personally-set goals, and I don’t think I have anything left to prove to anyone but myself. That said, I am most proud of the things that will continue to help improve the member experience in the club after I’ve stepped down. This includes a dedication to creating, reviewing, and editing documentation to be more clear and helpful to membership. This could be the updated Voice Polices, or the revamp of the Character Creation Guide to help cut down on remands for new Character Sheets . Another great example of this is the Fiction Center, which serves as a one-stop resource for members to get all of the information they need about the Brotherhood’s Fictional elements. You can see the Reference Sheet of Places/Organizations/Characters, a recap of every storyline grouped into organized “Arcs”, and easily see what you’ve missed if you’ve been away. This is very important to me, because regardless of if you like what the main storyline is doing, every member should feel like they have an easy way to get an understanding of what’s going on. From there, it’s up to them to decide how they want to use that information to build and play their character. Shoutout to Bentre on helping update the main Wiki landing page as well. It now has a link to the DB Canon wiki page and should help answer new or returning member questions when they come up. Quick reminder for everyone to check out Atra's latest newspost that kicks off the latest club-wide ACC event. Click here to check it out. So that's where I'm at. Stay tuned for the next fiction update. Hit me up if you have any questions or concerns. With the "event" question I was more getting at a particular event (e.g. a GJW, feud, the Dark Crusades, internal clan event, etc.) that was your favorite more than a particular venue of activity. For example as a competitor I probably enjoyed the Rivalries ACC event the most because of the in-character connections I formed in it blows a kiss at Selika and for a more traditional event Tide of Freedom always stood out to me but maybe because it was my first event as a noob and even hopping into the middle of an on-going plot like a moving train I still felt a part of the story. As a leader I've often tried to duplicate that with mixed results. I think we've all had some kind of formative experience in the club we try to replicate in one form or another when we're in the leadership seat. This leaderboard looks interesting!! I hope that this works out! I enjoyed every event I was able to participate in and compete. So I don't have an answer, really. Most of my time has been developing events for other people. No disrespect meant to any of these event organizers. It's a lot of work to run an event. That said, in terms for learning from that? Don't repeat the Dark Crusades participation ratio format. Don't promise rewards you can't deliver on after 2 years. Don't repeat the Storyline from Great Jedi War X, where the antagonist only mattered to the GM and four people. Don't repeat Horizons, where the writer turns their character into the Deus ex machina. I had many issues with these events. But none of that prevented me from competing and being active and barely missing an entry. Ah, that makes sense. Thanks for the answers and I am also looking forward to another leaderboard to whore myself out to. I know it's far from concrete, but would you adopt the FIST policy of staff being ineligible for placement and if so, would this extend to the ACC staff? I’m excited to see this fiction leaderboard. Thanks for taking the time to make this club a truly awesome place to be. Staff would be eligible. Voice and CM would not be.